Well, hey! I figure now that it's April and we've all clearly gotten over carb-banning early months of the new year, that we can get real once again and talk about the good stuff in life. Like bread. And let's just go all in here and talk white bread. YOLOOOOOOO. Since relocating to my hometown of Chicago from San Francisco a year and a half ago (!! ), I've gotten deep into the art of Midwestern baking. What it looks like, what it tastes like, what it means, the roots of it all. It's been good for the brain, the spirit, the soul. When I left the Midwest in 2003, there was so much about this place that I didn't realize was special, interesting, or different from other parts of the country. I guess that's to be expected when you grow up somewhere and just take the little things for granted, and I realize this is not a unique story. But what is unique is getting the opportunity to come back, not just after having spent my entire early adulthood on the west coast, but the early part of motherhood, too. Because now coming "home" isn't just about me. It's about making a real home in the place where my earliest memories live, and suddenly recalling those memories, one after the next like I've unearthed a dusty box of Polaroids and Beta home videos, with my kids who are currently forming their own earliest memories. TRIPPY. I even might use the word "meta" here if I felt confident enough about using it correctly? Anyway, what all this has meant in terms of my life and my work is that there's been a shift. In some ways, it's been quite transformative--when 13 years of West Coast life fell away, feeling a whole lot like the end of an era, I was a little let down. And so much of that had to do with having grown up in the middle of the country, where coastal life seemed to so many of us like the end point, a place you'd never want to leave if you actually made it there, like Gold Rush pioneers struggling to reach the Pacific or something. It's true that there's nothing quite like California--the landscape, the variety, the top-notch avocados, the light (particularly Southern California light, glorrrrious as it is). There's also the fantastic West Coast mindset of experimentation, always innovating and trying something new. This is what makes food writing and recipe development as a Californian so exciting; it's a very present-and-future-focused place. There's always something inspiring at every turn to scribble down in a notebook and bring back to the kitchen. But while I loved that, and it really did wonders for my work, it does start to all feel like a crazy spinning wheel after a while. I found myself craving history, tradition, especially when it came to baking. I've always been drawn to vintage recipes, food history, the whys and the hows. And although I suppose you can ask these questions from anywhere, it's not exactly the first place the mind goes when you're embracing that California vibe. At least, that how I felt, first just a little, and then like a primal scream. It was time to find a place to slow down a little. And so here we are, and yet, I'm busier than ever--isn't that always the way? But the good news is that I'm busy doing things that I love and am really passionate about, like researching the unique and storied baking of the great Midwest. 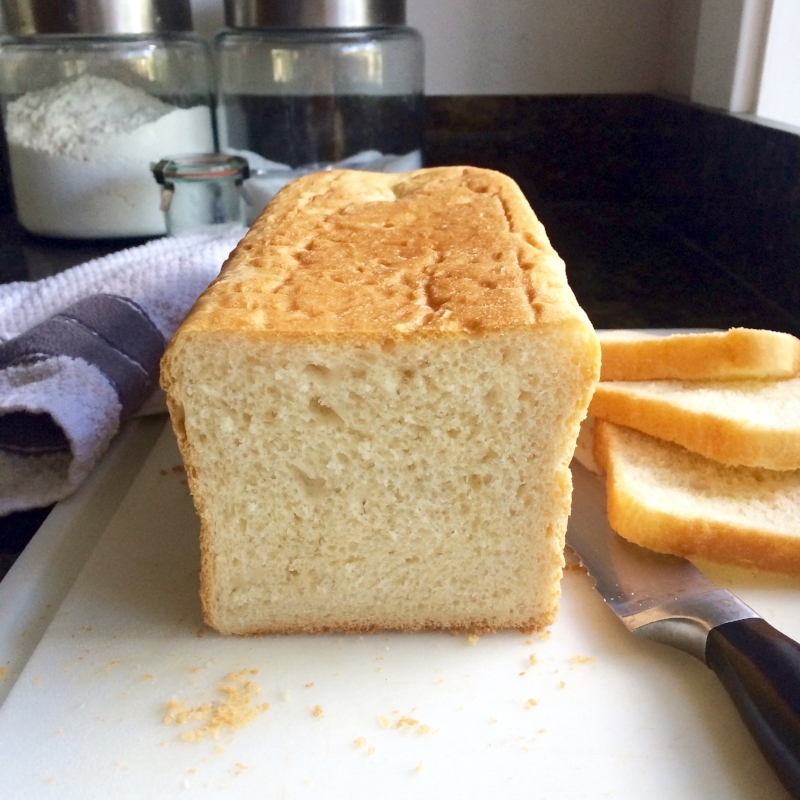 One of the earliest recipes I started playing with in the kitchen of our new home is a classic white sandwich bread, a perfectly square loaf from being baked in a special lidded bread pan, longer than most, with a thin, golden crust that encases a surprisingly tender, tight-knit crumb. To be fancy, you can call it a pain de mie, which it absolutely is, but it's commonly known as Pullman bread because the perfectly square loaves became the signature bread of Chicago's Pullman rail cars in the late 1800s, since they were space savers in a tightly packed rail car--three square loaves would fit in a pantry shelf normally occupied by two domed loaves. Shape aside, it's the perfect type of bread for picnic sandwiches, thick-cut with a schmear of mayo, stacked with a modest amount of meat and cheese, the type of sandwich that calls for the use of an old-school wax paper baggie. In short, it tastes like coming home. This bread is meant to be quick to make with little hands-on time--the dough comes together delightfully quickly and is fun to shape. A lidded pan is essential--I love my Pullman pan, and recommend this one (ahem, not sponsored). I've made this bread both with a warm rise, as written here, but I've also experimented with a cold rise as well, and really loved the results. Simply work a day ahead, and do the first rise in the refrigerator for at least 12 hours. It's divine that way when you have the time--you might lose a little rise when it bakes as the yeast loses some spring from the longer rise, but the flavor payoff is totally worth it. In a bowl of an electric mixer, whisk together the water, sugar, and yeast. Let rest until bubbly, about 5 minutes. Meanwhile, in a heatproof measuring cup, combine the milk and butter. Heat in the microwave until hot to the touch and the butter has melted, about 1 1/2 minutes. (you can also do this in a small saucepan over low heat, being careful not to let the milk boil). When the yeast has begun to foam, add the flour and salt to the bowl. Pour in the milk and butter mixture. Stir with a wooden spoon until a shaggy dough forms. Fix the mixer with a dough hook, and knead the dough on medium speed until soft, smooth, and elastic, and the dough is clinging to the hook, but moving cleanly off the sides of the bowl, 5 to 6 minutes. (Alternatively, you can knead the dough by hand on a lightly floured surface for about 10 to 15 minutes.) Briefly remove the dough from the bowl, spray the bowl with nonstick cooking spray or oil it lightly, and replace the dough in the mixer bowl. Cover the bowl with plastic wrap and allow it to rest until doubled in size, about 1 hour. Lightly grease a 13-by-4-inch Pullman pan and its lid with oil or nonstick cooking spray. Next, shape the loaf: Flour a work surface generously. Scrape the dough onto the work surface and gently press out the air, shaping the dough into a rectangle as you do so, approximately 10 inches by 7 inches in size. With the short end closest to you, fold the longer left side into the center of the rectangle, pressing the seam tightly. Repeat with the longer right side. Repeat this folding into the center with the two short sides. Rotate the dough 90° so one longer side is now closest to you. Fold and press the longer sides into the center once more. Flip the dough over—you should now have a nice smooth surface for the top of the loaf. Gently and evenly roll the dough back and forth to form a 13-inch log. Place the dough in the prepared loaf pan. Cover the pan with plastic wrap, and let the dough rest for a second time until it reaches just about 1 inch from the lip of the pan, no higher, 45 minutes to an hour. Position a rack to the center of the oven, and preheat it to 400°F. Slide the cover onto the pan. Bake for 25 minutes. Remove the cover and bake for 20 minutes more, or until an instant-read thermometer inserted in the center of the loaf reads 190°F. Turn the bread out of the pan onto a wire rack and let cool completely before slicing. Store in an airtight container for up to 3 days.